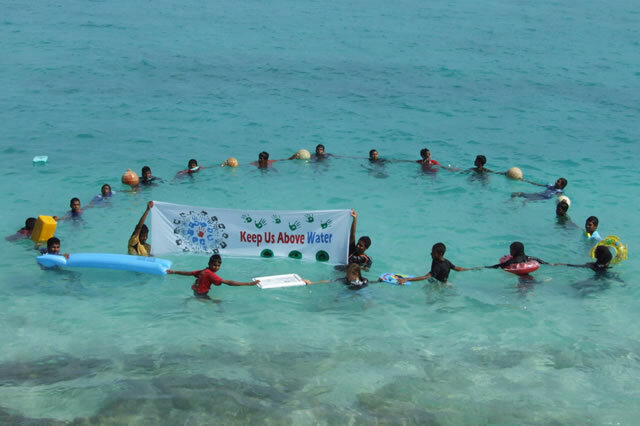 The people of the Maldives have embarked on a plan to become carbon neutral by 2020. But they cannot do it alone, they need the rest of the world to support them to achieve this goal. Photo: Mohamed Fahumee. When it comes to human suffering, the IPCC doesn’t mince its words. According to its latest report – the culmination of seven years of research and intense negotiations – climate change is on its way to causing “severe, pervasive and irreversible” damage on the world’s people, cultures, ecosystems and economies. The report identifies a series of imminent risks, including illness, the breakdown of infrastructure and public services, food and water insecurity, and loss of rural livelihoods. The human cost of global warming has a name: climate injustice. The remedy, then, is climate justice. Climate justice is not just the recognition that climate change is a matter of human rights and development; it also involves recognising that the victims of global warming are not responsible for it, nor can their actions alone halt it. Take the Maldives islands in the Indian Ocean, coral atolls vulnerable to rising sea levels. In 2009, the country’s leaders and its people showed extraordinary foresight and courage as they embarked on a plan to become carbon neutral by 2020. But they cannot do it alone, they need the rest of the world to support them to achieve this goal. Solidarity is at the core of climate justice. It is about sharing the benefits and burdens of climate change – and our response to it – fairly, making sure that the 1.3 billion people living without access to electricity and the 2.7 billion relying on biomass for cooking reap the benefits of access to clean, sustainable energy. Climate justice also means sharing responsibility. Those most responsible must take the lead and show greatest ambition in their domestic climate actions and support for vulnerable countries. As we make the transition to a carbon neutral world, we should all participate in the decisions taken along the way. This is the challenge of climate justice, finding fair solutions to a global problem. The concept of climate justice has an advocate in one of the world’s leading legal organisations. The International Bar Association (IBA), the global voice of the legal profession, has released a detailed report on the role of international law in addressing climate change (pdf). Its assessment is frankly shocking. It finds that climate change touches on every area of international law – human rights, trade, investment, migration – and everywhere the law is coming up short. Yet the report is also full of hope. The authors, a group of eminent lawyers from around the world, looked hard at the international legal system and found that more effective and coherent use of existing laws, rules and norms would inform better climate responses at the international and national level. The report is also full of practical and realistic suggestions for reform, from sharpening state obligations under international human rights law to getting the World Trade Organisation to state clearly and publicly that trade policies aimed at reducing greenhouse gases do not fall foul of the rules. Of particular interest is the report’s strong call for better human rights protections for the victims of climate change. States must take into account the fact that carbon emissions cost lives. Likewise, I back the report’s call for nations to have the courage to prepare the ground for a legally-binding commitment on climate change which will address not just climate change but climate justice. The IBA’s backing for climate justice is pivotal, but we cannot leave climate justice to the lawyers. Climate justice is about all of us. It is about acknowledging our personal responsibility in an interconnected world. It is about acting outside the narrow confines of self-interest – even as it becomes clear that our self-interest can destroy the lives of our own children and grandchildren. The IBA report is not the last word on climate justice, but it is an important and credible voice. It is a clarion call, and a sign that the word is spreading. The only solutions to climate change are fair solutions that protect human rights and uphold the rule of law. This article was first published in the Guardian Sustainable Business on 9th January.